van Gogh appeared (via re-enactment) in an episode of Unsolved Mistaken Amputations which the Simpson family watched. 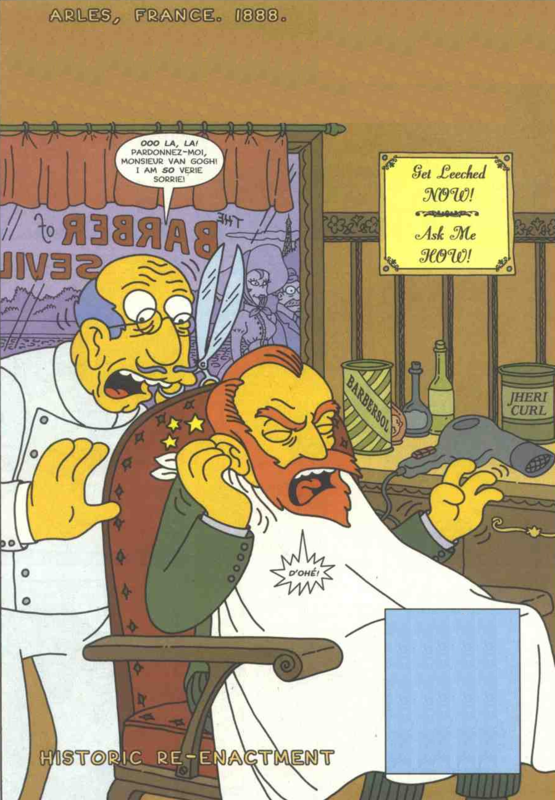 The episode was set in Arles, France in 1888. van Gogh was getting a haircut, but the barber accidentally cut his ear. van Gogh was missing the lower part of his left ear in real life. While there is a general consensus among historians that he cut it off himself, there are some who believe otherwise. Unsolved Mistaken Amputations is a tongue-in-cheek alternative explanation for what happened to his ear. Modified on June 6, 2013, at 15:09.